The following requirements must be met for proper operation of the SIGMA 34 Monoplace Hyperbaric System. Flooring should not produce static electrical discharge. Carpeting is not recommended. Conductive flooring not required. Air/Oxygen Supply: 50-90 psi @ 30 scfm (3.4-6.2 bar @ 850 lpm). Pressure gauge and shut-off valve installed in accessible location in both air and oxygen lines. Termination to be 1/2” female NPT, 2 feet above floor for connection to chamber supply line. Installation to be in accordance with publication CGA G-4.1. The Sigma 34 is supplied with all necessary hoses and fittings to easily connect to the customer provided services described above. 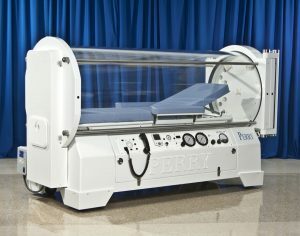 All building services should terminate within three feet of the foot of the hyperbaric system.